Note: *** Brad Cheney re-visited the course in July of 2006, and offers his �Second Opinion� at the end of this article. DAVIDSONVILLE, MD -- Life is full of imitators. Look around and you'll see cloned golf clubs, bad lounge singers crooning contemporary favorites and family-style neighborhood dinner theaters performing famous Broadway shows, all seeking to replicate the original art they copy. But something always gets lost in translation -- after all, it's hard to duplicate an artistic masterpiece. Thank God golf courses are immune to the trend. Some classics just can't be copied or replicated. Or can they? The true answer is 'no,' and that's the way it should be. But there should also be a way to play some classic golf holes without snuggling up to a member of an incredibly exclusive private club, or traveling halfway around the world to experience the legendary courses of the game. 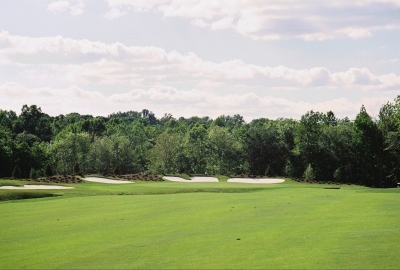 For those seeking the 'Grand Slam Experience' without the above-mentioned hassles, there's a pretty darn good 'imitation' just a short drive away -- Renditions Golf Course in Davidsonville, Maryland. Renditions opened its tee boxes in early May, offering public golfers a chance to play legendary golf holes without sacrificing a lung to receive the privilege. The azaleas might be missing, but the specifications are right when you walk over the Hogan Bridge to the re-created 12th hole at Augusta. Jeff Sheehan, Renditions' General Manager, says the brand new golf course offers 'Golf's Grand Slam Experience' by replicating eighteen famous golf holes from legendary courses in the United States and British Isles -- all of which have played host to at least one of golf's four majors (and the 'The Players Championship,' known widely as golf's 'fifth' major, if there was one). "We thought it was a great idea to take some great, time-tested, classic holes from famous golf courses and combine them into one facility, where anyone can come and play. We're offering the opportunity to play simulations of Augusta National's Amen Corner, the 17th hole at the TPC Sawgrass and three links-style British Open holes (amongst others) all in one golf round," Sheehan adds. Sheehan says his site worked well because of what it used to be: "When we conducted our land search, we found this abandoned salt & gravel mine. It's got some open areas, some stands of trees and was ripe for environmental reclamation after 60 years of pretty heavy industrial use. In other words, most of the parties concerned were pleased at our turning it into a golf course." At first thought, it would seem impossible to carve these different championship holes out of one piece of property. Sheehan explains: "We first took an extremely detailed topographical map of our site, become familiar with the lay of the land, then took equally detailed maps from the famous sites and began searching for holes that might fit onto our existing property." "We've always had a few staple holes we try to include (on their properties), such as Amen Corner, but then we look for holes that meet certain criteria on our land. If we have land for a downhill par four, we'll look for a downhill par four from one of the renowned courses. When it's all done, we'll build exact replicas of these famous holes to as close as plus or minus six inches from the real thing," Sheehan said. The devil's in the details. "We really try hard to make it look exactly the same. Where there's a dogwood, we'll put a dogwood. Where there's a pine, we'll put a pine. We'll put in azaleas as well (and other flowering plants for the rest of the season). We did whatever we possibly could to make the holes look as close as feasible to what you'd see if you actually went there," Sheehan adds. He continues, "They're extremely close--by using aerial photography, the distance of the holes is very accurate and the positioning of bunkers and hazards is fairly easy to adapt to. I'm not saying that if you walk the course you'd swear you were in Scotland or Georgia, but it's a pretty tight approximation." Here's the 2nd shot to Augusta National's 13th hole. A tad less pressure, though. 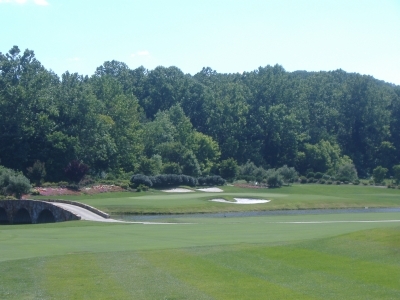 As a result, holes from The Country Club, Inverness, Oakmont and Winged Foot await you in Davidsonville, Maryland -- in addition to those mentioned above. Having heard about the course last fall, there was quite a bit of anticipation built up for actually going and seeing it. In past discussions with other golf enthusiasts in the region, some thought the idea was a tad over the top; others thought it wouldn't work; some thought it was a great idea, and still others had a 'wait and see' attitude towards the project. After playing the course, I can only say ... it's fantastic. Some of the holes were clearly recognizable from years spent in front of the TV, others were examined through tracing the written histories of legends, and a few I'd never heard of. But there was one thing that was never in doubt -- the idea works. Starting with the plaques that introduce every hole, you'll get an idea of the history that the hole represents, its 'worldly' location, and who made it famous. Seeing as the scale and arrangement of the holes is physically identical to the originals, it's not hard at all to imagine yourself on the property -- even if there aren't thousands of screaming fans around and stands of trees where there shouldn't be (in the backgrounds, of course). The course plays as difficult as you'd think it would, especially from the back tees. After all, there aren't any ninny holes out there. If these links are good enough to host major championships, they're certainly not going to be pushovers. Renditions' greatest distinction from what you'd encounter at a 'regular' course are the greens. You'll never garner from TV just how small the 12th green at Augusta is (Renditions # 7), how severe the 'humps' are at Oakmont (Renditions #15), or how steep the bunkers are at Winged Foot (Renditions # 17). Thankfully, Sheehan says the putting surfaces aren't rolling at what they'll roll one day (using A4 bentgrass) -- then you'll certainly be begging to avoid four putts on some of these things. Being so new, there are a few problem areas that will certainly work themselves out as time goes on. 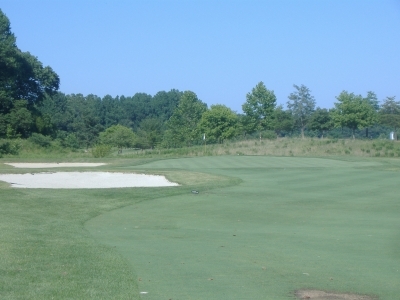 First, the course needs to grow in, in certain spots -- but what brand new course doesn't? Second, playing Renditions takes a 'major championship' sized chunk of time. Greenside at Augusta's 13th, you'll be amazed at the contours of the putting surface. Sheehan explains: "We've had some problems with pace of play since we opened, but I guess that's understandable. Part of the experience of coming here is reading the signs, and a lot of people want to play the back tees to walk in the shoes of the pros. Clearly, some don't belong back there, but we don't want to deprive people of their moment." Sheehan says they're taking steps to speed things up. First off, they're considering using forecaddies to spot tee shots on the British Open holes. That's an excellent idea, because if you hit one in the tall grass on those three holes, you won't have several score of tipsy Scottish golf fans locating your golf ball for you. It is possible (judging from experience) to lose a couple balls on these holes that never get more than a couple feet from the first cut. He also says they're considering installing GPS for the carts -- which will pinpoint the location of each group for course marshalls. But Sheehan acknowledges, having the satellite link may only make the problem worse: "We'd like to be able to put the histories and stories up on the GPS system, so if you go down 'Hogan's Alley' on Carnoustie #6 (Renditions # 12), you'll have an idea why that section of the fairway is called that. But at the same time, if you've got guys out there reading the cart displays, you're not speeding things up any." The delays were somewhat annoying, but it in no way took away from the overall experience. Seeing as nearly 100% of the golfing public will never get the opportunity to tee it up on most of these non-public venues (or even the incredibly expensive public ones), Renditions provides quite a thrill. And perhaps equally important, you'll gain new appreciation for the skills of professional golfers. Many weekend golfers can cork of the occasional 260 yard drive or hit a miracle shot close on an island green par three. But when you're faced with the prospect of performing at such a high level for eighteen tough golf holes -- that's a different story. Renditions also carries the themed golf experience beyond the fairways. The brand new clubhouse is designed to look much older, dating back to the era when Bobby Jones won the 'Grand Slam' in 1930. Sheehan elaborates: "Many of the classic clubhouses were built back in the early part of the 20th century, then were expanded as clubs grew in membership and reputation. We have that 'added on' look as well." Sawgrass was the first TPC course, and the 17th's island green its most famous hole. "Our pro shop is patterned after the 1930's era, where we pay tribute to players like Bobby Jones and Gene Sarazen. The grillroom is more like Gary Player, Ben Hogan and young Jack Nicklaus. Then as you proceed into the banquet facilities -- we feature a more modern look, like Tiger Woods and a 'current' Nicklaus as the theming element," Sheehan adds. Perhaps a final bit of appropriateness is there's no infringement on copyright involved in replicating legendary golf holes. The matter's been thoroughly litigated in the past two decades, and the courts have ruled that golf holes can be copied as long as there's proper accreditation and the respective club's trademarks aren't abused. So it's full speed ahead for Sheehan and his associates. "Oddly enough, the private clubs were the ones that didn't really mind us duplicating their holes -- Augusta National was even kind of flattered by it. Some public links thought it might move into their customer base, but I think most people would agree that we're really not competing for the same market," Sheehan said. The new Renditions golf course is just one of the latest quality additions to the region, and can truly boast of offering something no one else can -- a day at Augusta, Southern Hills, Inverness, etc. It is destined to become a favorite in the Mid-Atlantic. It also goes to show imitation can be art after all. Renditions' British Open holes highlight the difference between traditional links-style courses and their American cousins. 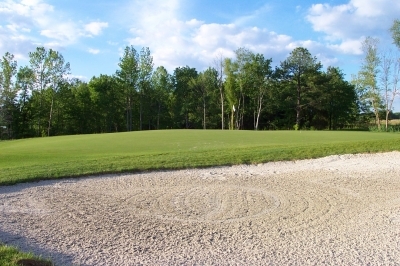 With a unique and entertaining design, Renditions Golf Course has quickly established itself as a �must play� of Washington area golf courses. With holes modeled from courses that have hosted a major championship, Renditions gives weekend hackers the experience of �walking inside the ropes� at a Grand Slam tournament. Very few of us will ever get to see, let alone play, Amen Corner at Augusta, Winged Foot, Medinah or Carnoustie. Renditions, however, does an excellent job attempting to duplicate those experiences, and it�s something we can play for ourselves. 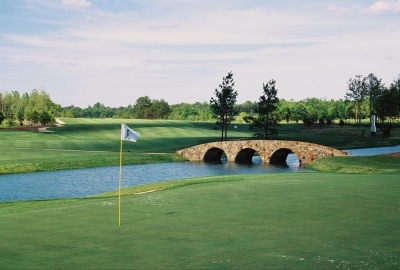 With plaques detailing the history of each hole, golfers are �transported� from suburban Maryland to Georgia, Florida, and even England. 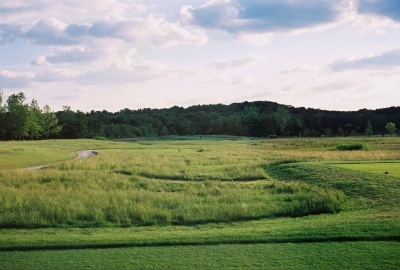 The 2004 US Open took place at Shinneock Hills in New York. 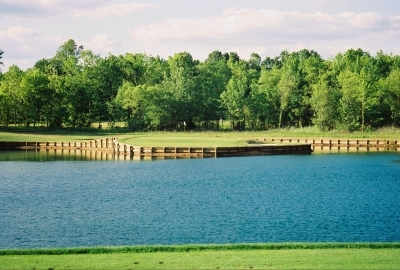 Come play one of its holes at Renditions, just to see what it's like. Due to the fact that the course re-creates holes from around the world, the design is unlike any other course in the region. This causes a lack of continuity from hole-to-hole, with the exception of the Links holes and Amen Corner from Augusta. It is also obvious that a tremendous amount of land had to be cleared to fit these holes on the land. Each of the holes at Renditions presents its own challenge, but collectively, they�re not impossible. 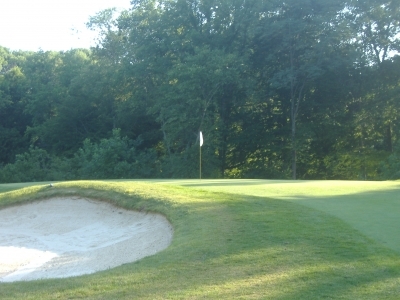 If a player tees up from the correct box, a round will be a fun and exciting experience. The most challenging aspect of the course is around the greens. The small size and subtle undulations of most the greens places a premium on the short game of every player. It also provides an appreciation of the tough courses the pros play every week! Oakmont's domed greens -- old traditional courses will teach you: one, how to hit precise irons, and two, how to putt. Renditions may not duplicate every hole on the course (some have since changed), but at the end of the round, every golfer will leave with an idea of what it is like to �Walk inside the ropes.� That�s an experience that only Renditions can offer to the average hacker in the area. Overall, Renditions was in generally good condition. The first few holes on the front nine had some bare spots on the fairways and greens. However, most of the holes are in excellent shape. Another look at Hogan's Bridge and the Green at Augusta National #12 (Renditions #7). Photo by Brad Cheney. Renditions has developed a reputation for being over-played in its first few years, but the problems that plagued it earlier were not evident when we played it (July, 2006). The fairways were in good condition, providing generous amounts of roll on tee shots. The greens were fast and the sand was soft, though in spots it could be a little deeper. The rough was not so long that wayward shots couldn�t be found, even in the middle of July. Indeed, the course has improved a great deal, and it will only get better in time. As trees mature and the course settles it only will become better conditioned, and more difficult to play. Hole #10, the 6th from Medinah, host of the 2006 PGA Championship. Photo by Brad Cheney. �Our number one focus is having the best golf course staff, regardless of the time of day, day of the week or time of the year that you�re playing,� says Jarvis. On this front, Renditions hits a Grand Slam. �Amenities are great - service from bag boys and clubhouse is quite good, the marshals were helpful and courteous and the clubhouse is well-furnished with a well-stocked golf shop� said fellow golfer Kevin Malecek. The domed green at Renditions' 17th hole, a recreation of the 7th hole at Winged Food, host of the 2006 US Open. Photo by Brad Cheney. 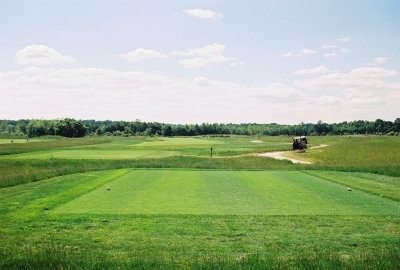 Renditions offers a large driving range, with both mats and grass hitting areas. There�s also a large chipping and putting green close to the clubhouse and first tee. Renditions is not designed in the traditional golf course manner with a return to the clubhouse between the 9th and 10th hole. Instead, there is a mid-course snack shop that players pass several times throughout the round. The well stocked snack shop has a wide selection of food, drinks and snacks. Renditions thrives on hosting corporate and charity outings. Groups of 20 or more can reserve tee times up to a year in advance. The course and clubhouse can accommodate groups of almost any size. The memorable design and outstanding service makes this course a great location for your next group outing. For those golfers who are looking for ways to play the course at a cheaper rate than the prime weekend rates, specials are sent out regularly to people who subscribe on the Renditions website. 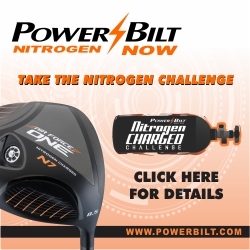 This is a great way to get on the course at a lower rate. 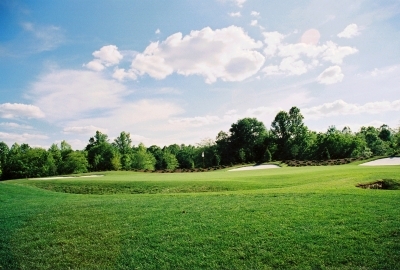 Golf Course Management - William Cole, Inc.